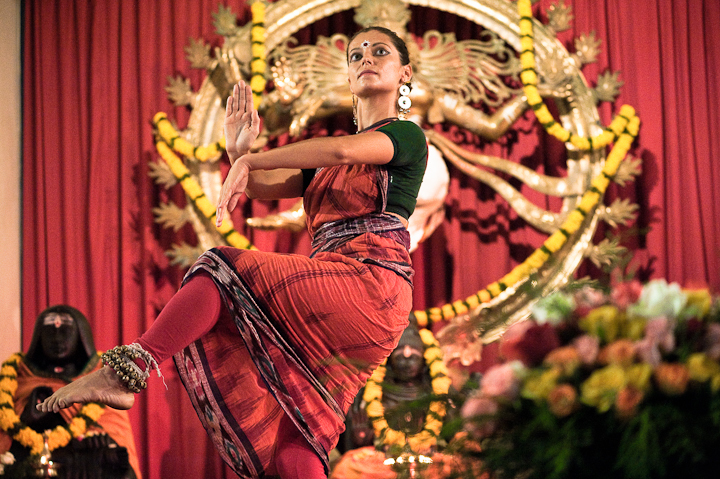 Andrea performs a wonderful ballet as the Dancing Shiva. Ananda: Why are you late?! Meedo: I was at the reception for two minutes. A: I don’t need to know why you’re late. M: You’re right. I’m sorry. A: You should be sorry. So why are you late? M: Well I was trying to find a computer for tonight’s slideshow. A: You don’t need to explain. You’re late. M: Right. It won’t happen again. M: OK thanks. I kind of missed you too. So went the (typical) conversation with my boss at the boutique. Today my karma yoga session ended with me taking photos of her again while this poor TTC guy tried to negotiate a price reduction on a rotting copy of “The Yogi,” which Ananda refused to give him. So he bought the bad copy anyway and five minutes after he left a fresh batch of copies arrived (did she know that will happen? is one of the many moral conundra we struggle with at the boutique every day). My Ayurvedic massage was a hot, oily, slippery, pungent, eye-burning, and very relaxing affair, after which I was thankfully able to take a shower at the hospital. I then met with the doctor (he reconfirmed that I am indeed Kapha, with maybe 20% Pitta thrown in). He then showed me some of his modeling photos and took some of me then asked me to take some of him administrating leech treatment. 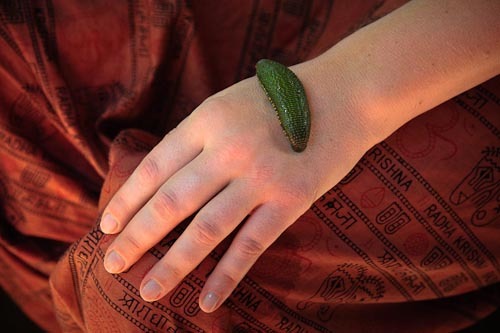 Leech treatment is just one reason why Ayurveda is not for the squeamish. Tsering said the TTC final exam was “a piece of cake” as she flashed me a big smile and ran off to her dormitory. Today has been a “slightly off” day. Not in a bad way; the world is just a little off kilter. It started last night actually — maybe because I took a shower in the evening (rather than the morning, which has been my habit) to dress up fro the TTC graduation ceremony later today. Anyway, I got to bed at 11 rather than 10, woke up at 5:30 rather than 4:20, found that my flip-flops had been nicked, and walked around in my sneakers all day. The “offness” continued with my attending the intermediate rather than the beginner yoga class and not even realizing it until the instructor asked me (with a very Indian head wobble) why I wasn’t doing the headstand when everyone else in the room was (Tsering’s was so graceful!). And now I’m at the Health Hut trying to figure out how to sort through my photos for today’s talent show, after having gone on a wild goose chase (starting with Joy, the technician Alistair said I should meet and ending with Nataraj, the Ashram director) for a laptop I could use. TTC graduation ceremony — hmmm so apparently these people are paying $2,000 for this, according to Josh (graphic designer from Sydney). The spirituality vs. commercialism conundrum rears its ugly head again. I guess it’s really what you make of it. The Swami in his commencement speech says “tonight is the end but tomorrow is the beginning of real life, or ‘maya’ as it is called, which is an illusion,” and someone yells “This is an illusion!” meaning the ashram. Corinne then points out that Lily may have left (I haven’t seen her all day). So, disillusionment, doubt, and anxiety are in the air, intermingled with excitement and joy — but that’s just the general vibe. As far as I am (and I guess Corinne and Chrissy seem to be) concerned, never take anything too seriously or too lightly. It is what it is. Let it wash over you and take from it what you want. “Parting is such sweet sorrow,” the Swami quotes Shakespeare (who he says is actually from South India) and he assures all the graduates that they will be sent eachother’s email addresses to keep in touch by messages and Facebook (!). 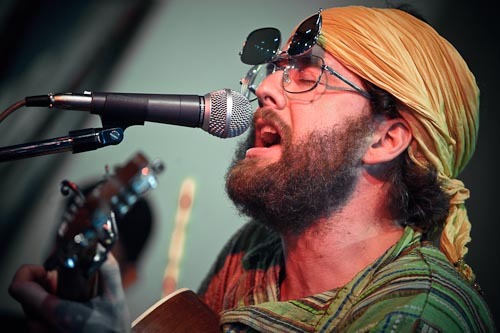 Mack brings down the house with his alternative ode to Shiva/Jesus. And so begins the talent show (yeah no laptop says Alistair, so I present photos next week, which is great — more time to collect material plus Josh has a MacBook Pro). Corinne leaves early as usual (“Om, out.” she says.) and I leave soon after that, but the show continues — I overhear an opera tenor at one point. Quick chat with Richard (wow huge spider! thanks for the photo op!) about Ayurvedic massage and oil-drip-on-forehead massage (I want to try that), a chat with my dormmate Matt (he shows me some very cool portraits he took in available light), and then bed. “I just want my bookshelf, some chives, and potatoes to sprinkle them on.” — Chrissy. I like it and I like the picture! How you can figure out what did you do? Even you took any kinds of great pic, it is nothing meaning. I really hope you do expiate what you did as human. Howdy! Do you know if they make any plugins to safeguard against hackers? Im kinda paranoid about losing everything Ive worked hard on. Any suggestions? Previous post: Day five: Freeday!